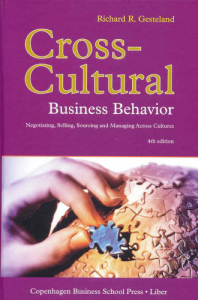 Understanding Business Cultures - D'Alfonso & Co. This is something well known to cross countries’ large companies, but it should be known to all people because, sooner or later anyone of us could find that the his or her rules, were not the same in other countries, mainly being associated to geographic locations, also there are some isles within the large areas. I was always interested in this kind of topics and read many books. The result is a better way to understand and manage diversity. Europe and North America belong to a deal oriented business culture, where we could synthesize: “Let’s make a deal, and probably we will start to meet one another and create a relationship beyond the transaction. Most of the remaining areas of the world take a completely opposite approach: No one will make any kind of deal with you, until a relationship will have been created and nurtured. It is not too much saying that you are likely not be able anyone getting anything by you, neither for free, if there is no previous effort to create a relationship. The most evident example of this type of business culture are India, and a large part of the Middle East. In relationships oriented business cultures, there are some things to consider. anyway you will need to be introduced, and mediation is a full professional, and required position, to go on in the process. A common question is about the actual value of foreign trade offices around the world, mainly within the embassy in the foreign states. The point is that if you have not any other kind of link with some mediator in such a relationship oriented business cultures, that is the only opportunity you could have to be presented to someone or some company, you are interested to get in contact with or show your product or services. I was no able to find much about the impact of the relationship oriented business cultures on the adoption of e-commerce and other ways to close transactions by the usage of “somewhere” sites. Hopefully some expert could make some contribution on this. What I am sure of is that the focus on people has some innate advantage, in anticipating the stop to some aggressive and not useful behaviors, and that in deal oriented business cultures, the most of this missing natural flow, needs to be replaced by some regulatory process.